The Smoothwall System enables you to create and edit custom DHCP options for use on subnets. For example, to configure and use SIP phones you may need to create a custom option which specifies a specific option code and SIP directory server. 1. Go to the Services > DHCP > Custom options page. • Option code — From the drop-down list, select the code to use. The codes available are between the values of 128 and 254, with 252 excluded as it is already allocated. Select when creating an option which uses an IP address. Select when creating an option which uses text. • Description — Enter a description for the option. This description is available on the Services > DHCP > DHCP server page. • Comment — Configure an optional description of this custom option. • Enabled — Custom options are enabled by default. Clear the selection to disable this option. 3. Click Add. 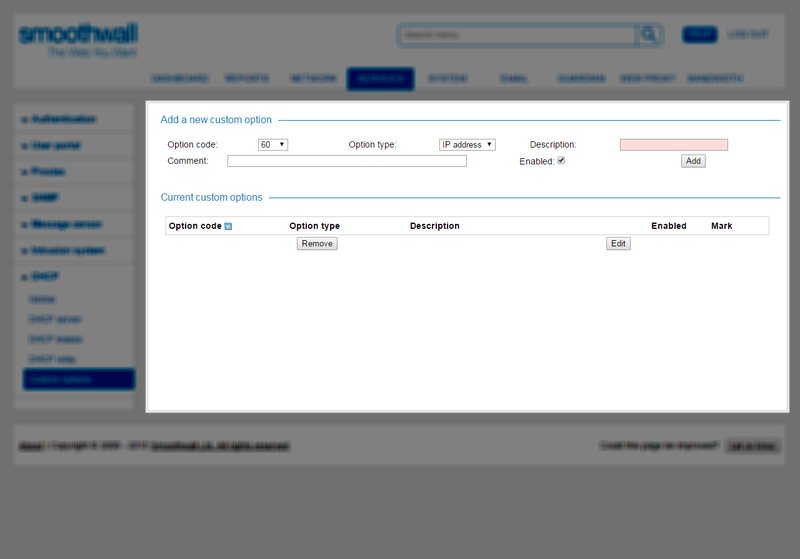 The Smoothwall System creates the option and lists it in the Current custom options area.